Brian is a landlord in a pub, the currently host parties and small wedding but their main function room has a maximum capacity of 50 so isn't suitable for most weddings. Brian approached us to discuss how he could use marquees to help him accommodate larger functions and weddings in particular. The first big decision is whether to host the whole function (ie seating, dance floor food and drink) outside or whether to use a marquee as an extension on to the existing function room. Gaining space with an extension is cheaper but requires a lot of thought to ensure there don't end up being two sub-parties to the wedding. At this stage Brian indicated he wanted to go for the extension option. This was due to the cost, his target market and also wanting to keep the marquee up without it taking over the garden and him losing the outdoor seating so popular in the summer. Everyone would be seated outside in the 6x16m Commercial DIY Marquee for the meal, no one would feel separated by being left seated inside. 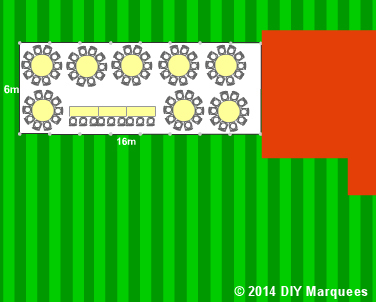 We suggested using one of our 6x16m Commercial or Deluxe DIY Marquees (see diagram below for layout) that could hold 80-100 guests for a wedding with plenty of room for walking between tables. Brian could shorten the marquee using one of our catering partitions for smaller functions. For future expansion we explained that Brian could attach another marquee on the side or could extend the marquee by buying an extension bay or bays and a larger roof.